But shouldn’t I be learning _? 2-2 How do I get Processing? 4-1 What is a variable? 6-1 What is iteration? I mean, what is iteration? Seriously, what is iteration? 8-7 Objects are data types too! 9-1 Arrays, why do you care? 9-2 What is an array? 10-1 Where have we been? Where are we going? 14-2 What is P3D exactly? 17-1 Where do strings come from? 17-2 What is a string? 23-2 If you did not have Processing, what would your code look like? 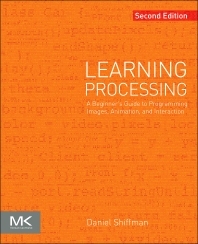 No previous experience required—this book is for the true programming beginner! Graphic designers and visual artists without programming background who want to learn programming. Students in college and graduate courses in interactive media or visual computing, and for self-study.